ARLINGTON, Va. — As temperatures rise into the the 80s this week, more people will likely be out on the sidewalks and roads, and that means area police agencies are reminding walkers, bikers and drivers to be extra aware. 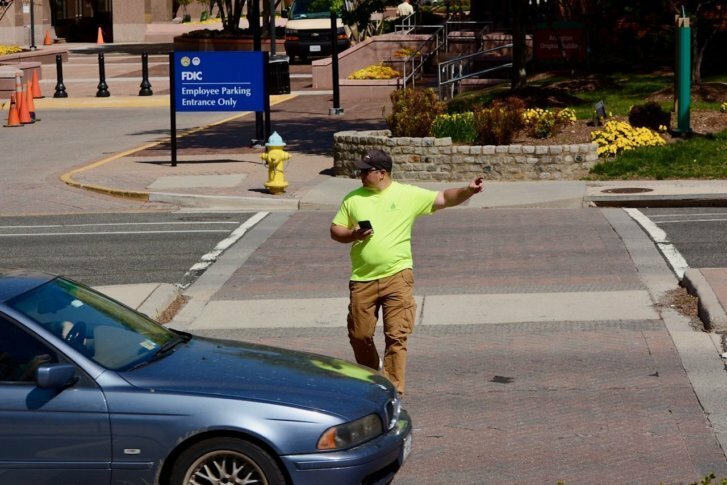 The Arlington County police put drivers to the test Tuesday, sending a plainclothes officer back and forth along a Fairfax Drive crosswalk. Drivers who failed to stop for the officer were promptly pulled over. “We have one officer functioning as a pedestrian a ways up the road. He is dressed in bright yellow. He waits for a safe break in traffic. The vehicles have a safe stopping distance of 160 feet. If they fail to stop for him in the crosswalk then officers up the road will pull them over,” said police spokeswoman Kirby Clark. During the enforcement period on Tuesday, police observed several drivers failing to yield for other pedestrians in nearby crosswalks. Dozens of drivers were given warnings, and 25 failure to yield citations were written. “With the spring weather, it’s easy to get distracted, but we want to remind all who use the roads – pedestrians, motorcyclists, bicyclists, motorists — to please be aware of your surroundings,” Clark said. The police are scheduled to return to the streets in South Arlington on Wednesday. Several other agencies, including the Fairfax County police, are taking similar steps this month to enforce laws aimed to keep pedestrians safe. The initiatives are a part of the Metropolitan Washington Council of Governments’ Street Smart Safety Campaign, which runs through May 13. The program aims to change pedestrian, driver and bicyclist behavior while reducing the number of traffic-related crashes and injuries.